In January of this year, we welcomed Wilma Cruise once again to the David Krut Workshop (DKW) in Johannesburg to collaborate with Master Printer, Jillian Ross. 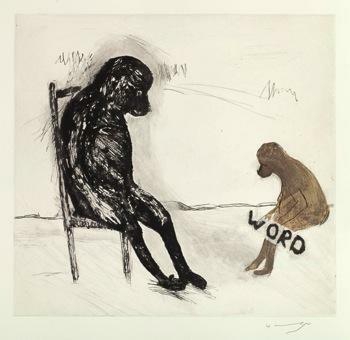 During the course of her time at DKW, Cruise created four new drypoint etchings and completed the varied edition, Harrismith – a carborundum etching which she first began work on in 2007. The Cape Town launch will take place at David Krut Projects’ new space at the Association for Visual Arts Gallery (AVA) and includes a bronze sculpture depicting a quirky duo of baboons. Baboon politics are rife in the Western Cape where man and animal compete for space and resources. The “wars” are hot and fierce with passions running high amongst the divided humans. There are those who want to see the baboons vanquished and those who wish to live in harmony with them. It is a microcosm of human conflict in which the individual animal is often forgotten. 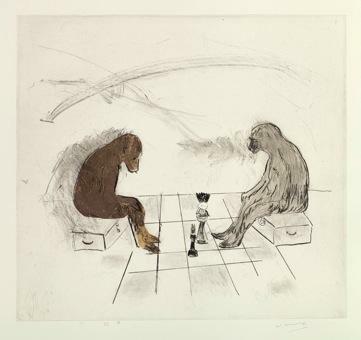 In an etching titled The End Game a pair of baboons contemplate the conundrum of the end of the world as they know it. 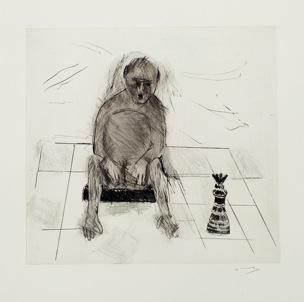 The large carborundum and drypoint work, Harrismith, depicts a human female figure, around whose neck is draped a large cat. The cat both presses into the head of the figure and appears to grow out of it. The figure bows her head submitting both to the burden and the comfort of the animal. The All-knowing Pig, like the Cheshire cat, smiles out of her frame, sealed in her hermetic world of ‘pigness’. It is a world closed to us human animals who have no access to her particular epistemology. Working from images that float up from Cruise’s subconscious almost predisposes them to incomprehension. It is only later that she is able to decipher their meaning. Like a dream that haunts one long after it has passed, these images eventually allow for a decoding of sort. This new body of work will be presented alongside earlier works by Cruise, produced in collaboration with DKW. In the juxtaposition of old and new work, the perennial nature of Cruise’s preoccupation with the “animal question” is clear. Please join us for the launch event on Thursday 13 August, 6pm at David Krut Projects, AVA Gallery, 35 Church Street, Cape Town. The exhibition runs until 5 September. For queries about availability and pricing, please contact Jacqueline: jacqueline@davidkrut.com. For high res images and press queries, please contact Kayleigh: kayleigh@davidkrut.com.